Color Club is really on a roll with all these scented nail polishes they've been doing recently. First, there was Wicked Sweet from summer 2011, then there was the Scent-suous Holiday collection that just came out a couple months ago. 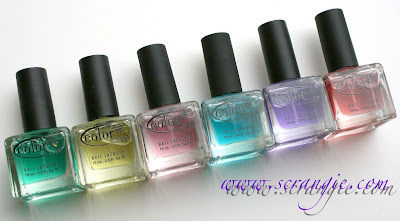 Now we have Color Club Copy Coats; six scented clear topcoats for adding fragrance to any manicure. 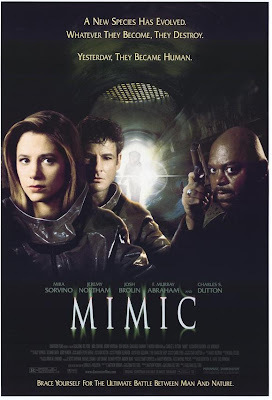 The colors are: Parallel Universe, Dead Ringer, Mimic, Duplicity, Replica and Copycat. Each Copycoat topcoat has a different scent and is slightly tinted. They're all practically clear, but over certain colors, you can definitely see a bit of a tint. Here's one coat of Dead Ringer, which has a yellow tint, over a three-day-old (excuse the chips and cracks) China Glaze Aquadelic manicure. It's not significantly different looking with the Copycoat topcoat, but it definitely has a yellow glaze added to it. I did two coats of these over white to show you how much tint you can expect. Parallel Universe, Duplicity, Replica and Copycat, two coats each over white. A little closer. Copycat, Replica, Duplicity and Parallel Universe, two coats each over white. These topcoats aren't quick-dry on their own, so I wouldn't recommend using them over wet polish as it'll make them take longer to dry. Since these are not quick-dry, they make excellent refresher topcoats because they won't peel, shrink or chip when applied over dry polish. They're very glossy and are perfect for adding the shine back to a day-old manicure. The scents in these aren't as strong as I had anticipated. They're subtle enough that you only smell them if you bring your hands close to your nose, plus the scents are so subtle that they only last about a day before they disappear completely. This is not necessarily a bad thing; persistent, strong scents on my hands can be annoying and headache-inducing. These give you the novelty of having scented nails without it being overbearing to the point where you get irritated with how strong they are. These scents all smell pretty familiar to me, and they're called "Copycats," so I did a little comparing with the notes and descriptions, and I think I've narrowed down what scents these are supposed to imitate. I could be wrong, as none of them smell exactly the same as the originals, but I also think something gets lost when translating them into nail polish form, so who knows. They do smell similar and the listed notes match up, so those are my best guesses. I think this is a pretty cool product to have if one of these fragrances is your signature scent or just one that you wear often. You can match your topcoat to your perfume! None of the scents really appeal to me all that much in nail polish form (they all have a bit of an 'air freshener' smell as topcoats), but scented topcoat is always more interesting than unscented topcoat, so I still like them. They look pretty all lined up in their square bottles. The scent is gone by the next day. Good refresher topcoats; they don't shrink or peel. The slight tint in these can alter your polish color. Not by much, but it still happens. The scents smell dull and air-freshener-esque in nail polish form. Not bright and lively like the Wicked Sweet or Scent-suous Holiday scents. They're not quick dry, so I can't use them as my usual topcoat. 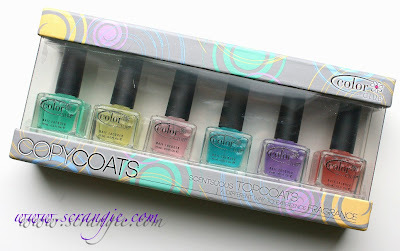 The Color Club Copy Coats Scented Topcoat Collection is available now, though the only place I've seen them so far is on Color Club's online store where they retail for $8 each. Interesting idea, but I'm not familiar with any of those perfumes to really feel the need to jump on their "matching" topcoats. I liked the food-y scents from the Christmas ones more. These are also available on nailsupplies.us the last time I checked. Dead Ringer was the only thing I was thinking about getting as I wear the same perfume, however if they really are dull and like air freshener type, I think I'll pass. 8 bucks?! Whoa... I don't think I'll have these anytime soon. This past summer I wore The Lime Starts Here from the Wicked Sweet collection. I immediatly loved it so much that without thinking I ran up to my boyfriend (in front of his friends) and said loudly "Smell my fingers!" Needless to say, there was a lot of laughter. So obviously I want these...or at least the one that's similar to the Parisenne scent. That's my fave perfume at the moment. Scented polish seems like such a weird concept to me... Think it'll take a bit longer before I'm convinced to try it. These seem interesting and a bit weird, but I'm not going to go out of my way to get them. I might give them a try if they were to show up at my Ross, but then again, I might not. I'm not really liking that they have a tint to them. Woo I want Dead Ringer! Always wanted to try a scented nail polish, just that majority of the colors look too much to something that's already in my collection. Now I get to use it as a top coat with the color of my choice perfecto! these are certainly interesting. i might pick one or two up if i see them in passing but don't think i NEED these. Interesting concept. But what's the point if there is next to no colour and no smell after a day. If I ever actually kept nail polish on for more than a day or two I would be all over this, I love scented stuff! These would have been great if they were more tinted. Could have used them to make jelly sandwich manicures. Nice concept but I'll skip these. Sometimes those smells make me a bit sick. I do love perfume so I just want my fragrance. Wow. I commend you for attempting to depict the tint of those color club scented units. I *think* I can see it..but maybe I'm just imagining things. Yeah, scented polishes. I have one from Revlon, the smell is amazing fruity, but the color is horrible. Hurray to these scented topcoats!! Beautiful colors on your eyes, but damn girl… You sure do curl your eyelashes sharply I hope that you're not hurting your eyes! I just spotted these today so I went to see if you reviewed them. :) It's an interesting concept. Maybe I'll try out Mimic since I wear Parisienne quite a bit.